A test of UNCW’s new lightning alert devices, installed as part of the university’s ongoing commitment to the safety of its students and employees, is scheduled for 12:30 p.m. Friday, July 20. UNCW installed lightning detectors at the multipurpose fields off Riegel Road and Hamilton Drive and near the Student Recreation Center outdoor pool. The devices have horns that sound in 15-second bursts when lightning is detected within 10 miles of campus. “This system will provide timely, localized warnings about lightning nearby, which will enable us to evacuate the fields and swimming pools more quickly to prevent a potentially dangerous situation,” said Tim McNeilly, campus recreation director. In addition to the horns, the devices include strobes that flash until the all-clear signal is given. When the lightning has moved away from the area and it’s safe to resume outdoor activities, the horns sound three rapid bursts. The signals are tied to subscription software. The horns have a different sound than the sirens the UNCW Alert system would activate in the event a campus-wide emergency, such as a tornado warning or active shooter. The weather detection system will be used only when there are programs scheduled on the recreation fields or when the pool is in use, McNeilly said. 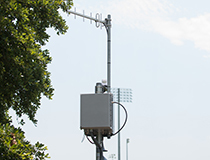 The lightning detection devices and a new campus weather monitoring service, WeatherSTEM, are among the latest technology-based tools UNCW has launched to keep students, faculty and staff informed of weather conditions on campus. UNCW’s Environmental & Health Safety Department and Randall Library collaborated on WeatherSTEM. Stationed atop the library, the state-of-the-art system combines the latest in weather and camera equipment. WeatherSTEM information is available online and, in the fall of 2018, the system will add a free phone app.